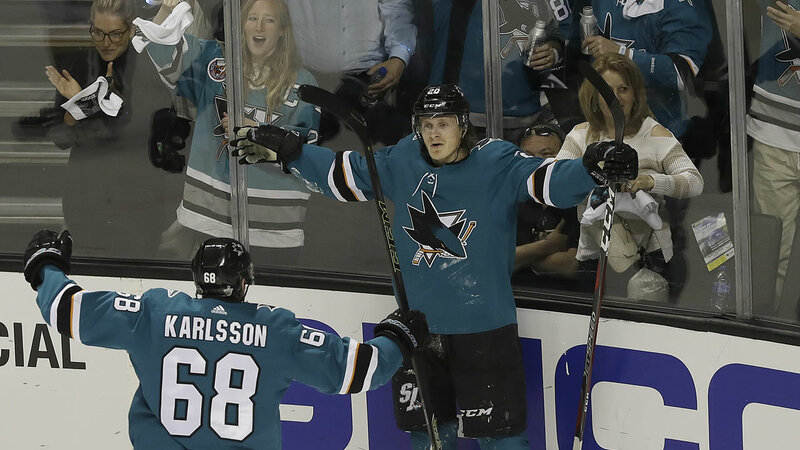 SAN JOSE, Calif. (KGO) -- The San Jose Sharks kicked things into high gear at the SAP Center to shut down and shut out the Las Vegas Golden Knights, tying their Stanley Cup Playoff Series to 2-2, scoring four goals to the Knights 0. Both the Sharks and the Knights swept their first series,' so fans knew that this one would be a show-stopping affair. As the clock wound down on the first period, the Sharks showed grit with their defensive moves keeping the Knights out of the attack zone. An opening came for a San Jose lead when Right Wing Marcus Sorenson, made a relentless pursuit of the goal line, scoring on Vegas goalie Marc-Andre Fleury. The Knights lost their momentum, which led to another few shots on goal for the Sharks. Eventually, Sharks' Right Wing Joonas Donskoi scored the second goal for the men in teal with help from defensive player Brenden Dillon. The Sharks' passion for hockey, and the Stanley Cup, was present on the ice as players continued to go all out near the goal and make the most of several power plays throughout the second and third periods. Center Thomas Hertle opened the Sharks' mighty jaws with a third goal in the second period -- his fifth of the postseason. Hertle has had an impressive season with 22 goals and 24 assists in 79 games. Sharks goalie Martin Jones did his part to shutout the Knights with 23 saves in just two periods. Where the offense was attacking, the defense collapsed back to help Jones protect the goal. An incredible pass from Logan Couture to Captain Joe Pavelski yielded the Sharks' 4th goal -- sending a message to the Knights that this battle is far from over.